Smithsonian Folkways has a great offering for the holiday season. Released in 1989, Traditional Christmas Carols by Pete Seeger is a sure hit for the banjo, folk or bluegrass fan. Long a seasonal favorite, this collection of 13 charming Christmas carols from French, English, Italian, and African American traditions captures the Christmas spirit with wonderful universality. These international holiday favorites include Twelve Gates to the City, Mary Had a Baby, and The First Noel. 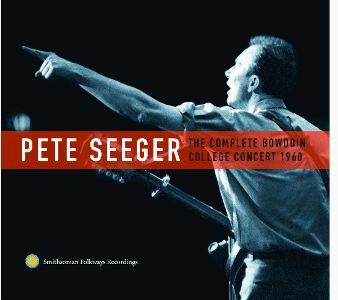 New York, NY -- Hachette Audio, a division of Hachette Book Group, announced that it has published a truly unique audiobook—Pete Seeger: The Storm King. The Storm King audio collection presents Pete Seeger’s captivating spoken words in new recordings as he tells his most engaging stories, narratives, and poems—all set to new music produced by world renowned percussionist/producer Jeff Haynes—created by nearly 50 musicians from traditions as diverse as African Music, Blues, Bluegrass, Classical Guitar, Folk, Jazz, Native American Music, and World Beat. “This music brings out things in my words that I never knew before,” says Seeger, who will celebrate his ninety-fourth birthday May 3, 2013. Folk/Activist icon Pete Seeger, 93, surveys past, present and future on two new CDs. Pete Remembers Woody is a two-CD set that celebrates the centennial birth year of Pete’s friend, quasi-mentor and sometime musical partner, the late Woody Guthrie, through Pete’s spoken, firsthand reminiscences as one of the last contemporaries of our country’s first great topical songwriter. Interspersed are renditions of Woody’s songs by Pete with Woody’s son Arlo, other Guthrie-influenced performers, and Woody himself (from a vintage recording). A More Perfect Union, which includes guest appearances by Bruce Springsteen, Tom Morello, Steve Earle, Emmylou Harris, and Dar Williams, contains 14 fresh songs that present Pete's and longtime friend and fellow songwriter Lorre Wyatt's responses to recent political, economic and environmental issues alongside gentler appreciations of life’s good moments, meditations on the future, and exhortations to individual action. After being blacklisted during the Red Scare of the 1950s, folk song revivalist, civil rights advocate, and social activist Pete Seeger began performing unannounced "community concerts" at schools, camps and community centers. Seeger considers these performances to be some of his most important work. On April 17, 2012, Smithsonian Folkways will release The Complete Bowdoin College Concert 1960, recorded live on campus at the Brunswick, ME, school in 1960.